We must not think that beneath the surface of the oceans there is nothing going on. No, for indeed the finest flowers grow there, and fish glide between them. 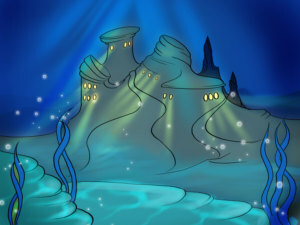 Standing in the deepest spot of all, is the Sea King’s castle. Its roof is covered with shells, which open and close as water flows over them. In each shell there lies a glittering pearl, which is fit for a queen. The Sea King looked after his children alone, and his mother kept house for him. She was a wise woman and a very caring grandmother to the six little sea-princesses. They were all lovely, but the youngest was the prettiest of them all. Her skin was soft and delicate, and her eyes were as blue as the sea. But, just like all the others, she had no feet, and her body ended in a fish’s tail. She was quiet and thoughtful – very different from her sisters. While they got excited about the wonderful things which they found in shipwrecks, she cared only about her pretty red flowers and a beautiful white marble statue of a handsome boy, which had once fallen to the bottom of the sea. She made her grandmother tell her all she knew of the world above the ocean and nothing made her happier than to hear these stories. “When you turn fifteen,” said her grandmother, “you will be allowed to swim up out of the sea, sit on the rocks in the moonlight and to watch the ships sailing by; and then you will see all I am telling you about. You’re all a year apart in age, so you will have to wait five years for your turn to come.” Sadly she was the one who longed the most for her turn to come, and yet she had the longest to wait. Time passed and the eldest turned fifteen. She promised to tell her sisters what she saw on her first visit, and what she thought the most beautiful. 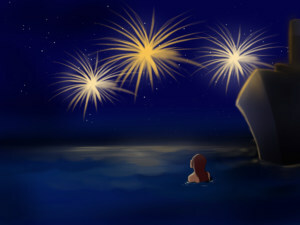 When she came back, she said she had seen hundreds of beautiful things, but the most beautiful was to lie in the moonlight, in the quiet sea near the coast, and to gaze on a large town nearby, to listen to the sounds of the music and the voices of human beings. A year later the second sister was allowed to rise to the surface of the water, and to swim about where she wished. She rose just at sunset, and this, she said, was the most beautiful sight of all. The whole sky looked like gold with violet and rose-colored clouds spread on it, and it all reflected in the water. The third sister was the bravest of them all, and when the time came, she swam up a broad river. On the banks she saw green hills covered with beautiful vines, and forests with palaces and castles sitting in them. Little human children were playing in the water and she wanted to play with them, but they got scared and ran away. She said she would never forget the beautiful forest, the vines, and the children who could swim in the water, even though they didn’t have fish tails. The fourth sister was more fearful. She didn’t approach the shore but stayed in the sea. The sky above looked like it was made of glass, she said, and this was the most beautiful thing. The fifth sister’s birthday was in the winter; so when her turn came, she saw what the others had not seen. The sea looked green, and large ice blocks were floating about like pearls. 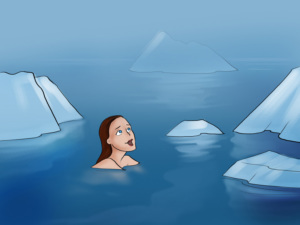 She didn’t know that they were called icebergs. Each had a unique shape, she said, and glittered like diamonds. 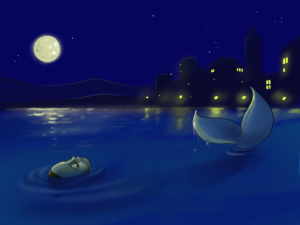 She didn’t know why people were afraid of them and steered away while she floated calmly on one of them. 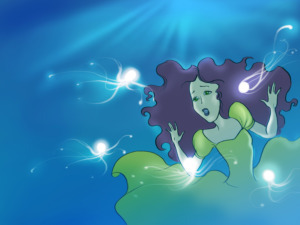 At last the youngest princess reached her fifteenth year and she rose to the surface of the water. The sun had just set as she raised her head above the waves. The sea was calm, and the air mild and fresh, but there were clouds glowing with purple and gold. 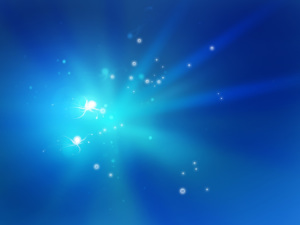 Through the glimmering twilight the evening star shimmered in all its beauty. A large ship was anchored nearby. 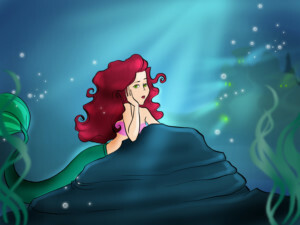 The little mermaid swam towards the cabin windows and as the waves lifted her up, she glanced through the windows, and could see a number of well-dressed people inside. The most beautiful of all was a young prince, with big dark eyes. It was his birthday and that was the reason for the joyful celebration. When the Prince appeared on deck the sailors lit a hundred rockets into the air, making the night as bright as day. 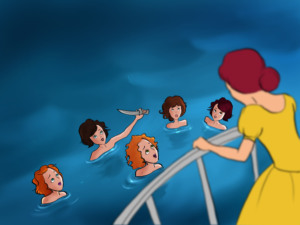 They scared the little mermaid so much that she dived underwater. But she soon resurfaced, and then it seemed as if all the stars in the sky were falling around her. She had never seen fireworks before. 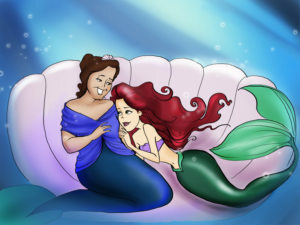 It was late but the ship sailed on and the little mermaid swam along because she couldn’t take her eyes off the prince. But soon the waves became as high as mountains and the ship groaned and creaked. To the little mermaid this seemed good fun, but to the sailors it was no fun at all. 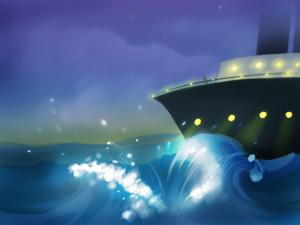 Soon the waves broke over the ship and water burst onto the deck. 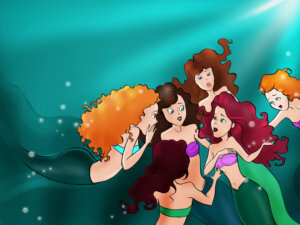 The little mermaid now understood that this was a dangerous situation. And remembered that human beings are not as good swimmers as merpeople. It was pitch black and she couldn’t see anything, but then lightning struck and she was able to scan the deck. 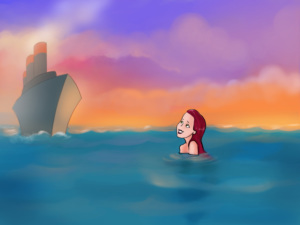 She couldn’t see the prince anywhere, so she swam to find him, forgetting that the beams and the planks could hurt her too. 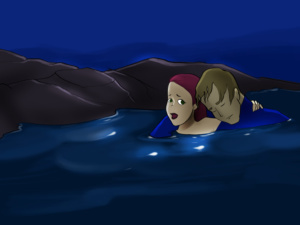 She dived a few times before she found him. His eyes were closed and his breathing was very weak. 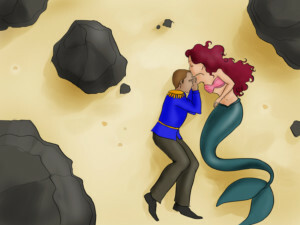 If it wasn’t for the little mermaid, the prince would have died. 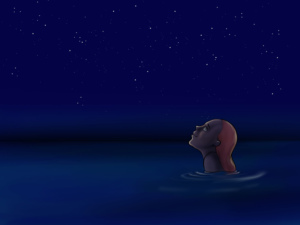 She held his head above the water and let the waves drift them to the shore. In the morning the storm died down and when the little mermaid opened her eyes, she saw that she was lying on fine, white sand and the prince was right next to her shoulder. She lifted his head higher than his body and kissed him on the forehead. His breathing was steady and she longed for him to open his eyes and fall in love with her instantly. When the bells began to ring in the great white building nearby, a number of girls came out into the garden. 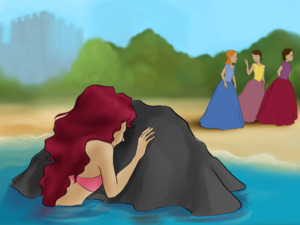 The little mermaid hid herself behind tall rocks in the water and waited to see whether they would find the prince. After a little while, one of the girls noticed him. At first she seemed afraid but then she called the rest for help. 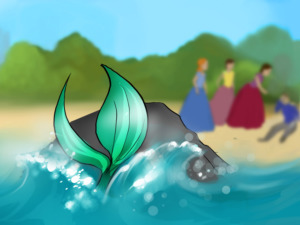 The mermaid watched the prince from a distance. He regained consciousness, and smiled at everyone with his charming smile. But he did not know that she was the one who had saved him and so he didn’t smile at her. 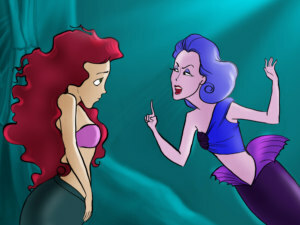 This made the little mermaid feel so miserable that she dived gloomily and returned to her father’s palace. Her sisters met her joyfully and asked her what had taken her so long but she didn’t answer. She had always been quiet, and now she was even more so. 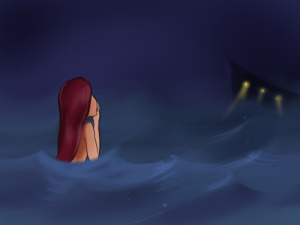 She would often swim up to the place where she had left the prince, but she never once saw him. Her only comfort was the beautiful statue, which looked like him. At last she couldn’t keep the secret any longer and she told one of her sisters all about it. When you tell someone a secret, it doesn’t stay secret for very long and soon all the other sisters knew. 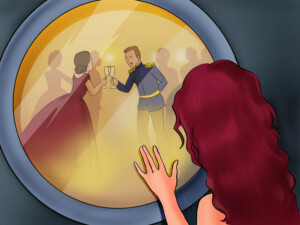 In an attempt to help her youngest sister, one of the mermaids asked her closest friends who the prince was, and she soon found out who he was and where he came from. “Come, little sister,” said the other mermaids, and they held their arms and rose up to the surface of the water, close by the palace. 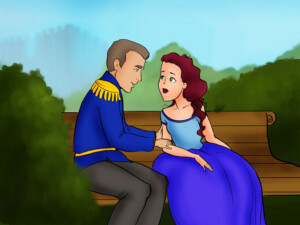 Now that she knew where the prince lived, she would sit at the shore and would watch him. He also seemed to be quite lonely. 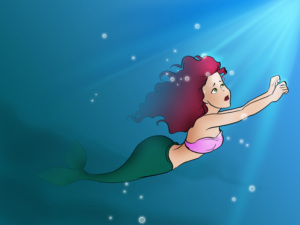 She would often hear fishermen talk about his good deeds and she was happy that she had saved him. If оnly he could remember that she had saved him! 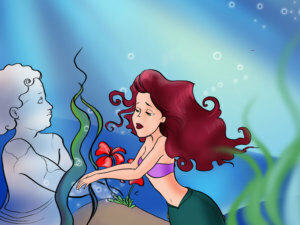 The little mermaid grew more and more fond of human beings. One day she asked her grandmother, “Do humans live forever?” “They die just like we do, but their life is shorter than ours. 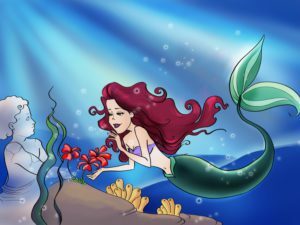 We canlive to be three hundred years old, and then weturn into sea foam, while humans’ souls live forever.” “I wish I were a human and had an immortal soul if only for a day,” the little mermaid exclaimed. That same evening there was a ball at the Sea King’s palace. 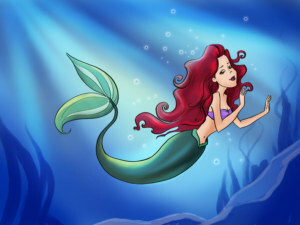 All the mermaids and mermen were dancing and singing happily but the little princess was dreaming of the world above. “I will go to the sea witch for advice while my sisters are at the ball. She will help me, although I’m so afraid of her,” she thought. 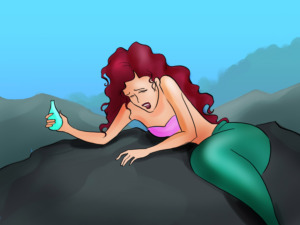 The little mermaid gave her voice for the draught and rushed to escape the witch’s house as soon as she could. When she returned to the castle, the ball was over. She wanted to say goodbye to her sisters,but she remembered she was mute and so she took a flower from each of her sisters’gardens, kissed each of them on the forehead and swam above towards the palace. She arrived at the shore when it was still dark and drank the magic draught. 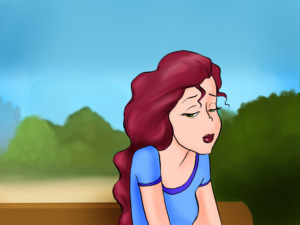 Instantly, she felt a cutting pain, so strong that she fainted on the rocks. 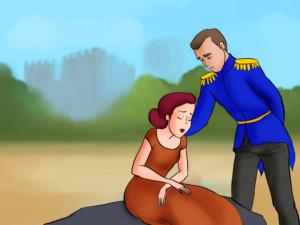 In the morning she woke up by a sharp pain, but when she opened her eyes, she saw the prince in front of her. She thought she was dreaming but he smiled at her, making her cast down her eyes. Then she saw that she had two legs instead of a tail. She then realized that she had no clothes on so she covered her body with her hair. The prince asked her who she was and where she came from, but she only looked at him with her big, beautiful eyes, unable to answer. He then offered her his hand and helped her stand up. The pain in her feet was of a thousand needles but still she stepped next to him as light as a feather and the prince thought he had never seen such a graceful girl. He brought her to the palace, where servants dressed her in a beautiful golden robe. The little mermaid was so happy to finally be at the palace, that she couldn’t stop smiling. The prince called her his ‘little foundling’. 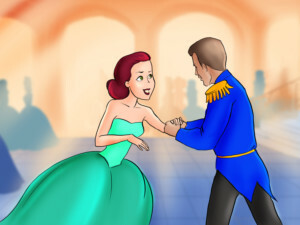 At the ball, held that same evening, he couldn’t take his eyes off of her as she danced. She danced like no one has ever danced before. The next morning the ship sailed into the harbour of a beautiful town. 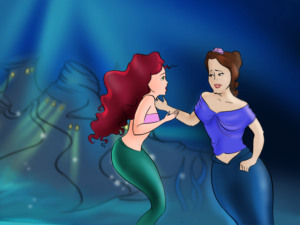 The little mermaid was very anxious to see whether the princess was beautiful. 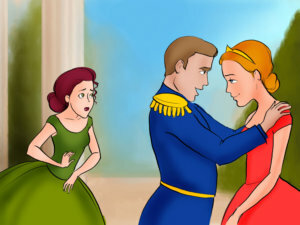 When she saw her, she had to admit she had never seen such a beauty before.“ I can’t believe that I found you!” the prince said to the princess. "It was you who saved my life when I lay on that beach!” He held his bride in his arms. Time passed and it was time for their wedding day. “Oh, I am so happy that my dreams have come true and you can be here on my happy day, my foundling,” he said to the little mermaid, as they were walking down the church aisle. 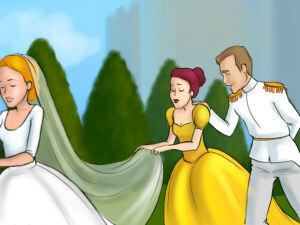 The little mermaid, dressed in silk and gold, held up the bride’s veil. She smiled at him but she didn’t hear the festive music, and her eyes saw nothing of the holy ceremony. She thought her own death, which was going to happen very soon. The wedding was held on the ship that same evening. 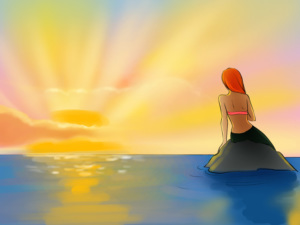 The little mermaid was gazing towards the east towards her father’s castle, when suddenly she saw her sisters rising out of the ocean. They were as pale as herself; but their long beautiful hair had been cut off. “We have given our hair to the witch so that you may live. She has given us this knife. You must put it into the heart of the prince and when his blood falls upon your feet, they will grow together again, and form into a fish’s tail. 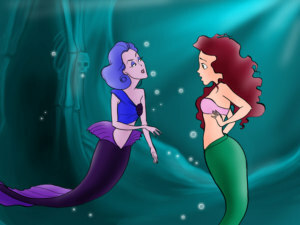 You will be a mermaid again! But you should do it before the sun rises. If you do it a minute later, you will turn into foam.” And then they sighed deeply and sank beneath the waves. The little mermaid took the knife and entered the bridal tent. She bent down over the prince and kissed his forehead. Then she looked at the sky which grew brighter and brighter. She then heard the prince whisper the name of his bride and the knife trembled in her hand. She threw it far away from her into the waves and the water turned red where it fell. She took one last glance at the prince, and then she threw herself into the sea, thinking her body was dissolving into foam.